Ballards Lane serviced offices are within a modern building that is located in Finchley, London. 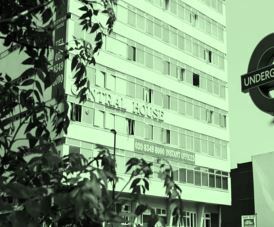 The building has good transport links with the train station just moments away and the M1 motor way not that far away. With plenty of local amenities, this office rental has shops, restaurants, and cafes within the surrounding area. The Business Centre itself has all the vital necessities for operating a company including a manned reception and meeting rooms. There is also car parking at the site that can be used. The office spaces available can be rented in all sizes on various term contracts starting at 3 months and extending to 12 months. Upgrading to a larger capacity office within the property is possible and can be done within a contract period. Completely furnished with desks, chairs and storage cabinets, these offices for let in Finchley are pre-installed with telephone and broadband cabling making it a quick and easy process when moving in. There is also 24-hour access to the suites.